Ride report: Yours truly, altendorf, hobinator and freshman rider matt ghering rolled out of ritual about 7:05, armed with steely determination to have a pleasant, uneventful ride. For almost 30 miles and within reach of the bridge to nowhere, we prevailed in our vanilla quest, but then without warning, matt was gone. Circling back, I found him on a forlorn, windswept stretch of path hard on the 101, looking dejectedly at his cool polished aluminum late-90s GT, fearing a date with a yellow minivan or a long walk to caltrain, and not without cause. 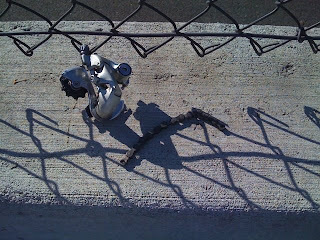 soon enough the culprit was appparent: catastrophic derailer impalement upon the spinning spokes of death. 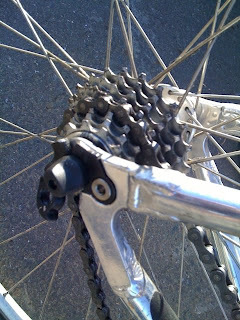 the hanger was ripped clean in half, the ol' 8-speed 105 was demo'd, and the chain was actually bent/twisted 1/3 rotation longitudinally. What to do? knowing hobe was well-equipped with supplies, I called eric, who was up the road a spell w/ hobe. eric returned with a chainbreaker, and we set about the macgyvering. 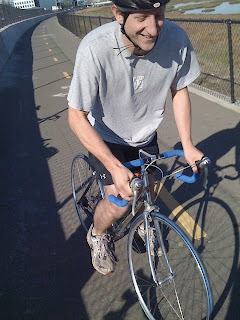 The only conceivable solution: Field conversion to single-speed. 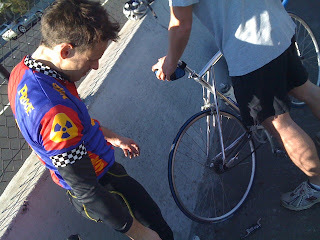 The pit crew thus deleted the stricken derailler, the superfluous shifter cable, 5 inches of chain, and the GT was reborn as a cool single-speeder and what do you know, we rolled in to G 11 miles later, all spinning a nice low gear like matt. some pics attached. What's the pace gonna be like? You up for having a newbie along?